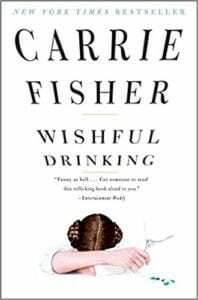 Wishful Drinking is a no-holes-barred tell-all tale about growing up in a famous, totally dysfunctional home, authored by one of the funniest actresses in Hollywood. Carrie Fisher, best known for her portrayal of Princess Leia in Star Wars, is the daughter of Debbie Reynolds and Eddie Fisher. As she is fond of saying, she is the “…product of Hollywood inbreeding. When two celebrities mate, something like me is the result.” Fisher recounts her early life with a loving, albeit celebrity mother who was often away filming a movie, and an absentee father who was more interested in his latest girlfriend. Fisher isn’t shy about exposing her father’s infidelities. When discussing how he left her mother for Elizabeth Taylor, the author describes her father rushing to Taylor’s side as “He dried her eyes with his handkerchief, then he consoled her with flowers, and he ultimately consoled her with his…” (fill in the blank). At 156 pages, with plenty of pictures throughout, and written in a conversational style reminiscent of Fisher’s stage show, Wishful Drinking is a quick read. There are plenty of laughs as Fisher is at her best telling her life story. It would have been nice to tone down the overuse of four letter words and some of the references are a bit crude. Quill says: Overall a fun, eye opening look at the life of Carrie Fisher.